In the last week of January 2019, we joined an estimated 8,000 others in the legal technology community in New York for LegalTech. For the past three years it has been part of the larger Legalweek, which includes a myriad of concurrent events including LegalCIO, LegalMarketing, Business of Law Forum, and Legal Diversity & Talent Management. Our week kicked off on a blue-sky morning with the Commonwealth Brunch in the famous Tavern in the Park. The Brunch is a tradition initiated by our late dear friend Nigel Murray. 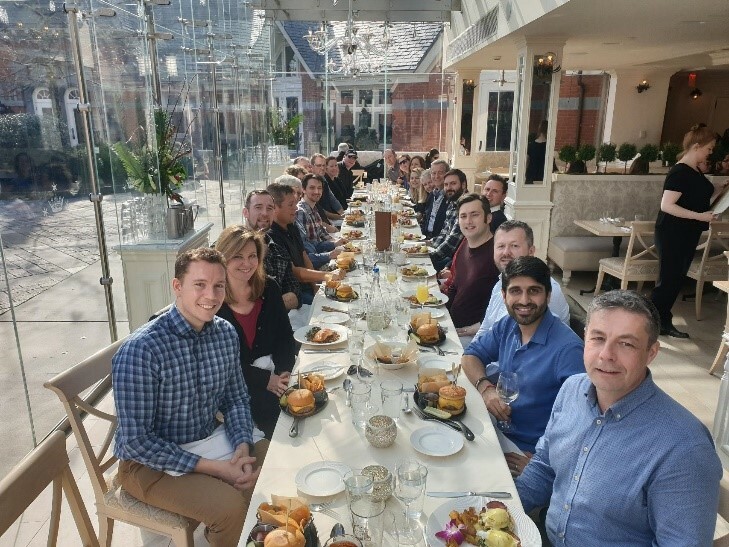 Nigel had been attending LegalTech for some 20 years and enjoyed bringing people together, particularly those travelling from the UK, Australia, New Zealand, Canada and India. Nigel was one of the UK pioneers in the eDiscovery and Legaltech industry and well known in the international eDiscovery community, including being the key note speaker for LawFest NZ in 2015. Thanks to Chris Dale for the toast to Nigel and friendship, and to Craig Ball for the photo. Special thanks to James MacGregor of Consilio LLC, Matthew Geaghan of Nuix, and Amit Pandit of Apt Search & Selection for organising and continuing this great tradition to start LegalWeek. To highlight the trends, Jobst Elster / InsideLegal.com produced a word cloud based on the event agenda (shown below). It is fascinating to see the evolution of themes over the years as the article also provides word clouds from previous events. You can see the evolution here https://insidelegal.typepad.com/files/2019/01/inside-legalweek-2019-legaltech-agenda-word-cloud-nine-years-and-counting.html. The biggest takeaway is how much is changing, and how quickly. The insights presented are common challenges and opportunities that can be applied to the delivery of legal services the world over. Many speakers highlighted the opportunities and necessity to innovate and embrace technology for today and the future. Privacy was also a focus, particularly the impact of the GDPR and the new Californian Consumer Privacy Law which will come into force on 1 January 2020. There was the fascinating 'fireside chat' with Alberto Gonzales, 80th Attorney General of the United States (2005-2007) and Loretta Lynch, 83rd Attorney General of the United States (2015-2017), as they explored Leadership in the Profession of Law and How It is Changing. They provided some great insights of their journey, together with the trends and evolution of the legal industry. They highlighted the important of preparation, hard work and the role of mentors in their lives. The Attorney-Generals both reinforced the importance of technology in practicing law today with AG Lynch reinforcing "you don’t want every lawyer to be the IT guy, but it is important for firms to make lawyers comfortable with technology". The Attorney-Generals discussed the challenge and priority of cybersecurity for government – it is the thing that keeps enforcement agencies awake at night – as well as for the legal profession and their clients. The rapid changes in technology and the need to protect IP and industries, including agriculture for food security were also highlighted. The important of privacy and the need for law enforcement to be able to access data in criminal investigations was also discussed. While the Apple case arising out of San Bernardino was a flash point in the tension between security and privacy, it is clear that the discussion and debate needs to continue. He also reminded us that AI is dependent on accurate data and that trust is a key issue. Again, we got to see some exciting new technologies and new releases. It is not solely about what is happening now, but more importantly what is on the road-maps. There were less exhibitors than in past years. This is hardly surprising as the legal innovation and technology market is a very competitive with many excellent events these days, together with evolving ways to gather information, than simply attending in person. Still, if you provide legal tech you are at Legal tech – in some form or another! There are many concurrent events that take place in Legalweek, where you can hear from experts from around the world together with technology and professional service providers. 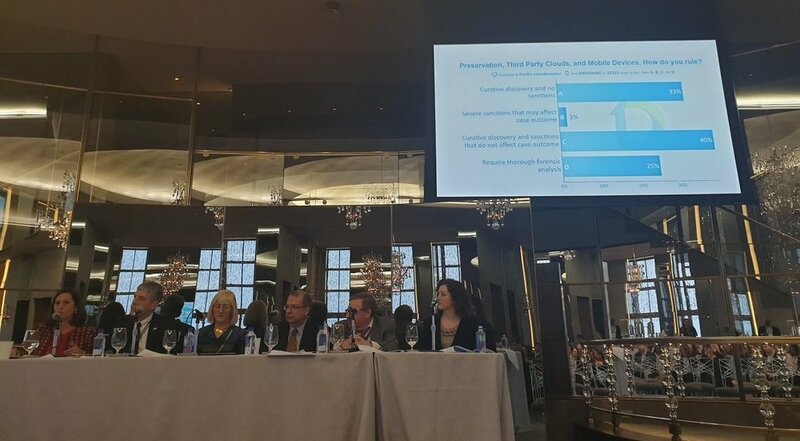 Susan attended the CDS Corporate Counsel Roundtable NYC 2019 and participated on the Data Privacy panel which focused on the latest privacy developments, particularly the impact of the GDPR globally and the new Californian Consumer Privacy Law – this session was facilitated by Chris Dale from the UK. Another interesting and interactive session was the Judges panel with retired Judges Francis, Hedges and Mass. The Judges panel was facilitated by Robert Levvy (ExxonMobil) and Robert Owen (Eversheds Sutherland) and discussed key takeaways from 2018 cases and expectations and trends for 2019. Another highlight was the Annual Judges Panel and the Practical and Ethical considerations for Social Media Discovery hosted by Driven Inc which took place in the iconic Rainbow Room in the Rockerfeller Center. The Judges Panel included Judges Rodriguez, Aaron, Laporte, Wettre and Peck (ret.) - the attendees voted on case studies which led to a very interactive discussion and interesting insights from the judges. The slide below shows how the attendees voted on a preservation, third party clouds and mobile devices case study where a legal hold had been issued and steps taken to preserve data, but 12 months later the General Counsel becomes aware that highly relevant data has been deleted. Legalweek which takes place in the depths of New York’s winter, enabled us to experience our first polar vortex. While it was extremely cold, the sunset from the Rainbow Room for the EY LegalTech 2019 reception was spectacular. Legaltech is a great week as everyone is in the one place, all the leading experts, together with technology providers. Many are from all over the world, who all have perspectives of how legaltech is (or isn't) impacting the delivery of legal services. The event is a great platform to share experiences and discuss issues, while catching up with the latest technologies and trends. The greatest value in legal week continues to be the networking opportunities. There are great opportunities to meet new people and also catch up with old friends. 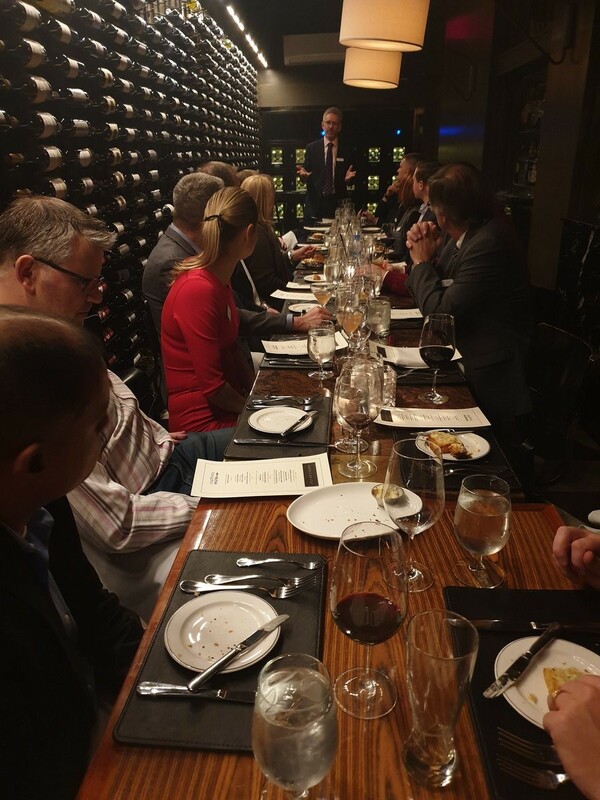 Below is a photo of InfoGovANZ supporter Active Navigation’s dinner at the American Cut Steakhouse – where it was great to catch up with Peter, Rich and the team. Special thanks to Denise Backhouse – Littler, Taylor Hoffman – Swiss Re, Peter Baumann – Active Navigation, Jo Sherman – EDT, Phil Favro – Driven Inc, Eric Schwarz – EY, Warren Kruse – Consilio, Bill Belt – CDS Legal, Wendy Axelrod, Bryn Bowen – Schulte Roth, Rich Kessler – KPMG, David Rohde – Epiq, Anthony Crowell – New York Law School, Julia Miller – Columbia Law School.